oooh what do you see? for all things Quilty Giveaway-ish. Don't forget to click the "follow" button over there! My mommy's broccoli is definitely my fave for Thanksgiving!!! YUMMO! Love scraps and my daughhters sweet potato dish. Sorry you don't like Canadians! I bet if I went to your Etsy Shop you would ship to Canada. Mmmm.... My favorite is sweet potato casserole. To be "right" it must have pecans in it and marshmallow goo on top. I really really like to have some pineapple in it too. Mmmmmmm....now I am hungry. Lucky for me that tonight we are going to Mexico Lindo. I also make a killer onion bread that is very moist. It is my "dressing" since I don't like traditional dressing/stuffing. I would just love to win your scraps. Scraps quilts are the best! Yeah more scraps! The turkey! I could eat plate after plate-dark meat! I need to start organizing my scraps. I'm fairly new to quilting, and most everything looks the same. I love homemade stuffing(dressing) and pumpkin pie! When I was a kid it was the mashed potatoes and gravy. Now it is the stuffing but I still love mashed potatoes and gravy - all the low-fat dishes! I love the hash brown casserole and the broccoli apple salad. Together with the turkey make a great meal. Thanks for the opportunity to win some scraps. Getting this opportunity to win some scraps for my collection is a special treat. Thanks for sharing. My favorite dish is one i made for the first time last year... sausage cranberry stuffing! I had never had stuffing before, so I blame this new tradition on my husband. I also love homemade mashed potatoes (the slightly lumpy, skin-on kind), and FUDGE. It's a good thing our family is either walking or running together in a 5K thanksgiving morning this year, because I'm hungry just thinking about it! My favorite Thanksgiving dish is definitely the sweet potato casserole. This year I'm using the Pioneer Woman's recipe and I can't wait! Love scraps, too and thanks for a great giveaway. Oh stuffing, we only have it once a year and I cannot wait!!! Thank you for the chance. My favorite thing about our Thanksgiving is having at my mother -in-law's home. She lives in the country in a 100 year old home. It feels like going back in time to go there. I love the wonderful dressing that she makes too! My favorite Thanksgiving dish is onion casserole! It has sweet onions, rice and swiss cheese and it's yummy! I think my favorite Thanksgiving dish is the orange salad, it's one of those sweet cool whip mixes with mandarin oranges amoung other things. So good! Favorite Thanksgiving dish - I usually look forward to the homemade stuffing and pumpkin pie. Just started organizing my scraps and bought some canvas bins at Big Lots. Would love to fill some of my bins with your scraps. Thanks for the chance. What's your favorite thanksgiving dish? When my mom moved to pennsylvania we encountered a new to us dish called corn chowder---YUM! Yeah-huh, I love scraps. And my favorite for Thanksgiving? Cranberry Cake. Try it - you're gonna love it. I know you didn't ask for the recipe, but you're gonna love it. (Heat oven to 350 degrees. 2 cps raw cranberries, 3/4 c chopped walnuts, 1/3 c sugar. Put into well greased 10" pie pan. Mix 1 c flour, 3/4 c sugar, 3/4 c melted butter, 2 eggs, 2 tsp almond extract. Pour over cranberries, nuts and sugar. Bake for 35-40 minutes). YUMMY! I've just started to organize my scraps in canvas bins. I'm hoping to eventually sort by color but I haven't made it there yet. loving me some cranberries. The sauce made with whole cranberries is my fave. Once a year. Nobody else likes it. What is wrong with people? Sweet potato casserole with all those gooey marshmallows on top! Pumpkin cake rolls with cream cheese frosting. Yummy. Thanks for the chance. i just love my mom's homemade noodles...thick and wide, just like i like them! she is the best cook! thanks for a chance. My favorite dish is always the sweet potatoes covered in marshmallows. My husband grew up in an Italian household so instead of turkey and potatoes and whatnot, they had meatballs and lasagna and whatnot. Needless to say we have more than enough leftovers to last a lifetime! Thanks for sharing your scraps with us! I bought one of those cube hinge from target and wish i had bought one for every room! I LOVE them! Green bean casserole! Don't know why but it's a favorite in my book. Thanks! Besides turkey and dressing, I love sweet potato crunch. It is so good! Myfavorite Thanksgiving food is stuffing with apples and nuts in it. I'd love to win your scraps! My favorite dish for Thanksgiving is either my pumpkin cheesecake or my stepmom's corn bread dressing!! Yum...thanks for the opportunity to win your scraps! I love the pretzel stuffing in the turkey. Pretzels, onion, celery, peppers and poultry seasoning and a little broth to moisten it. Yummy! Weird as it may sound: the brussel sprouts, roasted with a bit of olive oil and salt and pepper, yum. My favorite is pumpkin pie! yummy. Thanks for the great giveaway. Wow, what an awesome bunch of scraps. My favorite dish to make and to eat is my potato casserole. Can't forget the Turkey though. Thanks for the chance for this awesome giveaway. Oh my you have made some beautiful quilts I would love to win some of your scraps! I love the stuffing, the best is baked right in the turkey. I'm a new sewer, so I need to build up my stash! One favorite?! Too hard! But I guess I would pick my grandma's homemade noodles. My favorite Thanksgiving food is the cinnamon rolls my husband makes every year for Parade morning breakfast. He has to make dozens and dozens as we give to family and friends also. Thanks for the giveaway. Whole berry cranberry sauce right out of the can!!! Thanks for hosting a scrappy giveaway! MMMmmm love the double chocolate pie for dessert. thanks for the chance to win your scraps AND I'm glad I found your blog! I also love the sweet potato pie with loads of whipped cream we always have with Thanksgiving dinner. Sweet Potato Pie was the first pie I ever learned to cook when I was about 12 years old. My favorite Thanksgiving dish is turkey with stuffing. Yum!! Ooh, my favorite Thanksgiving dish is deep fried Cajun turkey and fresh made cranberry relish. Um-um good and can't wait to taste some. My favorite is pumpkin bread. Love your bins and I have been wanting to get a couple of the cubes with 9 spaces. I've seen them at Menards but haven't looked at Target. Love your scrap giveaway! I love this sew scraps along thing! I am finding so many great bloggers that I wouldn't have found myself. My favorite Thanksgiving dish is the stuffing. This year is my first Thanksgiving in my own home as a wife and soon to be mother. I hope I do our dinner justice! I most remember parsnips being served at Thanksgiving. NO ONE liked them, but we always had them. I mean who eats these? Or knows what they are!! Love the sorting idea, thanks. Off to check on the other blog now - it looks interesting too! My favorite would have to be stuffing. My mom makes the best bread and herb stuffing - nothing beats it. My Nana's Homemade ravioli is my absolute favorite. She makes the dough, and the cheese insides, and puts it all together....it is the best. We have it for thanksgiving and christmas. mmmm My mouth is watering just thinking about it! oh yeah, I would love to win some scraps too! My son says no to "yard bird" for Thanksgiving dinner this year so guess we will have Prime Rib...delicious. So many good things to add to it! I know there will be a favorite lemon cheesecake, too. Just wanting to get going with quilting...so scraps would be great! My favorite dish is squash cassarole. It's more like a crustless quiche. Love the scraps! Scraps scraps and more scraps..we'd love to create with them here! My favorite Thanksgiving dish is the turkey! My dad cooks it in a brown paper bag stuffed..and it comes out juicy everytime. Turkey day can't get here soon enough! I love the very simple cranberry relish that is mixed with fresh squeezed oranges and a tad bit of sweetener. It goes with everything and it is just as good as dessert. Yum! And I love scraps, they are so interesting and prompt me to improvise usually spontaneously just to create something. Pick me please! Thanks! OK let's admit it - it isn't the main meal at all - it is raiding the fridge a few hours later and making that jaw-breaker turkey sandwich. Turkey, lather with mashed potatoes, some cranberry relish, the pickles, oh go for it - add that spoonful of dressing. Oh I love the sandwich afterward. Hands down Brined Turkey, (I'm posting the "how to" on Monday). It's absolutely amazing and hurray for the pumpkin pie too! I'm loving your blog, and am sure I would be stoked to nab your scraps...only Jodi could get all of us to beg all over blogland! ;D Thanks for the chance. I live in the Middle East but can I still join as my family is in the US? If so, I love my turkey with my stuffing and homemade pumkin pie and a great green bean casserole and sparkling grape juice and, and, well, Thanksgiving is my very favorite holiday. My favorite thanksgiving dish is the upside down apple pie. Think of an apple pie with caramel and peacans oozing over it. Yummy! My favorite is dish is Chocolate Raspberry Truffle Pie. It is decadent and I make only twice a year. But the favorite thing about Thanksgiving is the gathering of family and my extended family. 20 of them I think this year. Thanks for the wonderful blog!! Wait, I'm supposed to have a FAVORITE Thanksgiving dish? Since Thanksgiving is my fav holiday, this is tough. I would have to say this year, I'm especially looking forward to making thankful rolls. You have each guest write down something that he/she is thankful for on a piece of light brown paper and then you put the paper in the crescent rolls! When they bake up, and people open them, they discover what everyone else is thankful for! <3 Thanks for the consideration! We don't do traditional Thanksgiving food. We usually try some sort of seafood/butter/mega calorie dinner. My favorite was crayfish etouffe. If I had to go traditional..it would be sausage and bacon stuffing. My favorite dish at Thanksgiving is the turkey leftovers! I have some special meals that I make with the leftover turkey, and my family looks forward to them every year. It has to be Pumpkin pie and I can't wait for turkey dinner! Thanks for hosting! I love the stuffing covered with turkey gravy. Then day 2, 3, etc I make stuffing sandwiches with mashed potatoes and cranberry sauce along with the stuffing. My favorite for Thanksgiving has got to be the pumpkin pie! Love scraps! I've joined Jodi's Sew Scrap Along! Thanks for a chance! I have never made a scrappy project, but the one I'm working on almost could've been. I just didn't have the right scraps for it before I started. My favorite Thanksgiving (any holiday, really) dish is actually my great-grandmother's cookies. My grandmother makes them for us now. They are no-bake peanut butter cookies, and they are the only requirement for me to eat at our family gatherings. I love anything with cranberries - even that horrible stuff that comes in a can! I love dressing or sweet potato casserole! I love the cranberry salad with ginger. SO tasty!! It is a toss up for me... before I was married, I loved my mom's strawberry-pretzel-jello-salad. But now that I'm married I'd have to go with my husbands strawberry-rhubarb-pie! Oh my. Homeade caramel apple pie is the best! My favorite is my mother's dressing (stuffing) balls baked in the oven. Thanks for the chance at the giveaway - I would love to win! I love homemade rolls and pumpkin pie. Honesely I just get a little taste of the other stuff and save room for plenty of buttered rolls and a huge slice of pumpkin pie! Thanks for the great giveaway. I love your blog. I like the way you have your scraps separated in the canvas bins. I love turkey and cornbread dressing and giblet gravy. I am for the south and actually love everything about Thanksgiving. Family, friends and the great food! My fave turkey day dish would have to be my famous "Drunken Turkey". Yes, drunken. I brine the poor unsuspecting bird for 24+ hours in a modified Emril brine recipe. Then on roasting day, I inject the poor fellow with sherry, brandy, whisky, or whatever I happen to have open on my shelf. Multiple times. Till the poor fellow is so full of booze that he absolutely reeks. Then roast according to Betty Crocker's timetable in the cookbook. I've NEVER had complaints about a dry (or flavorless) turkey in the 12 years I've been married. It's a close call between this and my father-in-law's smoked turkey. Thanksgiving is my favorite holiday. Turkey and stuffing, yum. Pumpkin cheesecake is my favorite recipe. Double yum! Love the scraps, would be great to add to my collection. I found your blog through Pleasant Home. My favorite Thanksgiving food is brussel sprouts with bacon bits. I would love to win an envelope or box whatever. . . Love scrappy quilts. I LOVE Pumpkin Pie. I eat on Thanksgiving and if there is any left, over I have it for breakfast the next day. I love everything there is about Thanksgiving dinner except the clean up. The stuffing, mashed potatoes and gravy, hot buttered beets but best of all is the pumpkin cheesecake!!!!! yummy. Usually my eyes are bigger than my tummy and I have the cheesecake the next day. Love, love, love scraps. My favorite Thanksgiving item is the Sweet Potatoes. I make them with an orange glaze that is so wonderful. Can't wait to eat them. Thanks for the give away. This is a hard one. I love Thanksgiving but if I have to pick I'd have to say pie. I have two favorites there, hot and cold. hee hee! My favorite dish is the pumpkin pie...but last year at my in-laws no one made a pumpkin pie because apparently none of them like pumpkin pie! What kind of craziness have I married into! Yay scraps! For me the stuffing is the highlight of any turkey meal. It would be the rolls for sure! They are homemade yeast rolls from a recipe I learned to make from my aunt and grandmother when I was growing up. Now I am the one in charge of making them every year for the big holidays. They are full of butter and I am sure horrible for you, but so delish!!! Wow, great scraps and difficult question! My favorite Thanksgiving dish, hmmmm.... is it the turkey I smoke in the Japanese Komado, or maybe the Carrot Soup - no, it's the Cheesy Potatoes ... I think ... well, I don't know, I really like them all. Oh pooh! I can't choose! Happy Thanksgiving! My favorite Thanksgiving dish is the fresh cranberry relish, made with a bag of fresh cranberries (duh! ), a whole orange (peel and all! ), and a cup of sugar - whiz it through the food processor, chill for a few hours, and YUM! Makes a great spread on turkey sandwiches, too! And by the way, I use those Target cubicles to store my fabric - they work great, and if you fold your fabric around a 5" ruler, you can fit two stacks side by side in each cubby! My favorite Thanksgiving dish is made with turkey-day leftovers and is called "turkey bake." Hmmmm, so good! Hope I win your give-away! I would love to win your scraps. My favorite Thanksgiving dish is the unexpected surprise side dish that someone brings to the meal. Most recently, my sister-in-law made a great broccoli salad that is delicious. I love rice pudding on Thanksgiving it has become a tradition. Love your scrap bins! Hi Norma, thanks for the chance to win some fun scraps. I love the stuffing my sister makes every year. I can't get enough of it! And I was delighted to come over from Pleasant Home and see my daughter on your blog header. How fun!! I called her over and we both got a kick out of it. Oh, I could use these scraps!! My favorite is dressing and cranberry sauce! Thanks for the chance. I'm not sure I can pick a favorite dish for Thanksgiving. I love the entire meal....it's a favorite holiday of mine for sure. I just found your blog and I'm loving all the wonderful inspiration. Pumpkin things are my favorite. My aunt's recipe for fake pumpkin pie (pumpkin pie with a yellow cake mix) is always one of my favorites. Oh and home made cranberry sauce with orange in it. Now I'm hungry! Thanks for the giveaway! I have to make two pumpkin pies every year for Thanksgiving. It's my favorite. Why 2? So I can have it for breakfast all weekend (silly!). Thanks for the giveaway! You are so inspiring! My favorite dish for Thanksgiving would have to be Corn Pudding-- sort-of a sweet corn bread with a banana-bread texture! Love it! Thanks for offering some of your scraps! I would love to win some scraps. Thanks for sharing. My favorite dish is sweet potato casserole with pecans and brown sugar on top...unfortunately I am the only one in my family that likes it!!! I love your scrap keeper system. thanks for the chance to take some of your scraps off your hands! I am probably in the minority but my favorite part of Thanksgiving is all the cooking in my kitchen for everyone. I LOVE cooking and if we did deep fried turkey that would be my favorite. I had one of those once before and OMG THE BEST but I'm not going to do that. I am partial to the leftovers made into a casserole woth the stuffing, gravy, and turkey. That's probably my favorite. OOOOH those boxes of scraps look like fun to dig into, especially the one box that I see beautiful purple fabric in. Awesome work that you do and I hope that I can be that good some day. Thanksgiving, hmmmmm... gotta be the mashed potatoes with turkey gravy! Lots of butter and cream in those mashed potatoes, too. They just seem more special at Thanksgiving than at any other time. Thank you for the giveaway. I love to have sweet potatoes (or yams) cooked the way my Mom always made them. Lots of butter and brown sugar. She passed away a few years ago and I have never been able to make them quite like hers. Thanks for the chance to win your scraps. Sweet potato pie is the best! Thanks for sharing your scraps. My favorite dish is the dressing. Once a year treat! Thanks for a chance to win. My favorite dish at Thanksgiving is pumpkin bars. They are like a pumpkin sheet cake with cream cheese icing. Yum! This is my first time to your blog, thanks to Pleasant Home, and I can see I will be spending a lot of time looking around. Fun! I am in love with fabrics lately, bitten by the sewing bug again and again. I don't love thanksgiving food, really. In theory yes but in reality... I don't like leftovers! But my favorite is the stuffing, with celery, onion, and apples! I would love to win your scraps. My favorite Thanksgiving dish is the Lemon pie that I make with my Mom's recipe. I remember srapping the pot when I was a child and I still like to do it now. :) Thanks for the giveaway. oh soooo many choices for Thanksgiving. hmmmm, homemade pumpkin pie. I use the cinderella pumpking. it's shaped like the cinderella pumpkin from the disney movie. it's a silvery bluish color. the pumpkin inside is bright orange! I just follow the recipe on the libby's can. there is such a difference in taste! yum yum! new to your blog, so fun!!! thanks for putting my name in the hat! Let's see, my Thanksgiving dish, hmmmm. It is sooooo hard to choose, because well, Thanksgiving is about making all the traditional favorites! I think I'll have to choose the fresh rolls that are made with sweet potatoes. They are just slightly orange, and taste fantastic with some honey butter! Makes me hungry just thinking about them! Well, this may sound strange, but my aunt's Brussel sprouts with vinegar and bacon are the BEST dish EVER at Thanksgiving. And she never makes it any other time of the year...they literally melt in your mouth! Thx for the fun giveaway - your scrap look so fun! Thanks for the chance to win some "scraps" I love scrap quilts to this is great. My very favorite Thanksgiving dish is home made cranberry relish, yum, that could be my whole meal, well with pumpkin pie of course. I too thank you for the chance to win. One of our favorite dishes is red chili sauce. It is made with red chili powder (from New Mexico) sausage, cumin, flour, tomato sauce, water and other spices. We pour this all over our dressing, turkey and other food. It is soooo good and have converted many people to our tradition. My favorite Thanksgiving Day dish is my mother's pecan pie. My brother loves it too so sometimes she makes one and hides it "just for her boy". Thank you for this giveaway. I am attempting to win some scraps because as a new quilter do not have my own. I want to make some of Pleasant Home's quilt examples. My favorite for Thanksgiving is my mom's coconut cream pie which I've learned to make since she is gone. Gotta say it`s Spoonbread! We only do it at Thanksgiving and Christmas. Add sour cream, butter, corn. So good it`ll make ya wanna slap yo mamma. I know the recipe says to use a 9x7 pan but I use my great aunt`s old handpainted oval ceramic dish. I got it when she died and it`s the Official Spoonbread Recepticle. Thanks for the chance to win your fun scraps!! Dressing - I made some one year with sausage crumbles that was AWESOME! Pumpkin Cheesecake!! My all time favorite! I love sweet potato with pineapple; it's just so delicious! Have you tried it before? Thanksgiving dinner has ALWAYS been my favorite meal...sometimes my birthday falls on Thanksgiving and that is just the BEST! I can eat the leftovers for days and not get tired of it! But it just isn't Thanksgiving without my mother's home-made rolls, which thankfully she insisted I learn to make. But I think of her every time I make them. I would adore winning your scraps! For years Thanksgiving was not my favorite Holiday up until the last several years when I have been able to cook the meal myself. I love dry brining the turkey and then cooking it with a buttered-cheese cloth. Makes the juicest turkey!! Yukon Gold mashed potatoes. So loooking forward to it. I just got back into quilting and would love to put your scrapes to good use. The pumpkin pie with the homemade whipped cream is definitely my favorite, although I also love all the veggies. I also love scraps, so my fingers are crossed! Pumpkin pie is my favorite!!! Can't have Thanksgiving dinner without that!, and the turkey of course!! Thanks for the chance to win! The stuffing is my favorite part! Yummy cornbread stuffing with gravy. Everything else is a sidedish! Hi Norma! have been hosting Thanksgiving dinner for the past 26 years, so what's my favorite Thanksgiving dish? The one that's made by someone else, of course! Thanks so much for the chance to win your giveaway!!! My goodness! wining this lot it would be Christmas before Thanksgiving to me! Well, well I REALLY like Pumpkin pie and I make it quite interesting - maybe cause I like pumpkin. You better stick with pecan pie! My two favorites at Thanksgiving time are the stuffing I make (that goes inside the turkey) and also, homemade sweet potatoes--bake the potatoes the night before until almost done. Cool, slice, add butter, cinnamon, brown sugar, a little maple syrup, and bake in the oven until bubbly goodness. To me, it's just like dessert! Also, thanks for the opportunity to find a new blog and a chance to win your scraps. I have a scrap quilt going now- dark blues and tans with orange accents. We have celebrated Thanksgiving in mountains about 4.5 hours from my home for the past couple of years. I usually contribute baked goods and in search of things that travel well have become known as bringing "The Festival of Pies". We have had pumpkin with a streusel topping, chocolate silk, pecan, and derby at least. It is about time to start on this year's list. Thanks for sharing your scaps. I like your canvas bins for storing scraps, great idea! For Thanksgiving dinner, I love all the food, but what tops it off is the homemade rolls. Yummy, can't wait! Thanks for the fun giveaway! Your scraps look as delicious as a piece of pie! 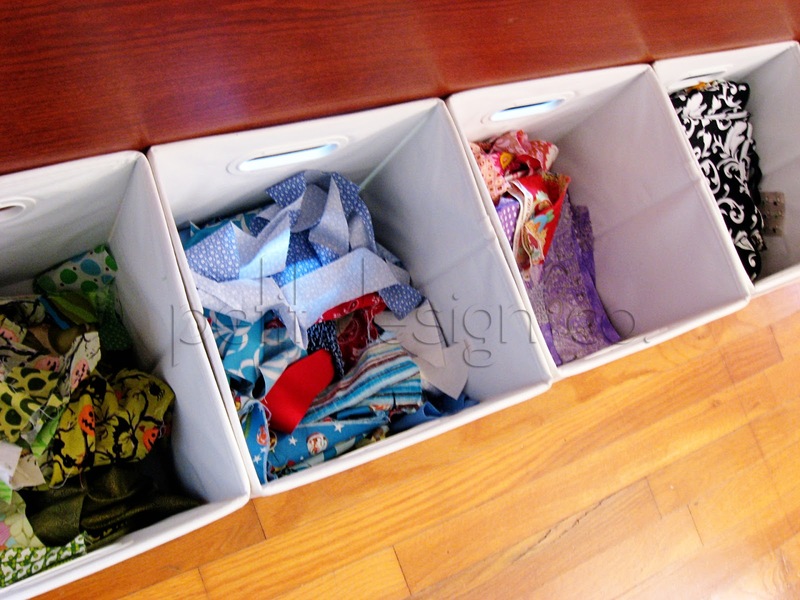 And I like your organizational bins which make your scraps easy to use. Favorite thanksgiving dish? Pumpkin pie, for sure. Thanks very much for sharing your fabrics with one of us. I would love a chance to win your scraps. Thanks for sharing. I make a mean Sausage Rice Casserole that is sooooo good!! Only make it once a year either Thanksgiving OR Christmas! I love the dressing made from my ex's grandmothers recipe. It tastes pretty good when I make it, but nowhere near as good as Nonie's. Thanks for the chance to win your scraps. My favorite Thanksgiving dish is also my favorite Thanksgiving memory. Every year my Mom would start out early in the morning sauteing onions for the dressing. With 9 of us and at least as many guests, she'd put her 22 lb. turkey in the oven about 9. Then it was a rush to the finish as she and the "girls" made the rest of the dishes. Luckily, she had a 2 oven Wolf stove, so there was always room for her 2 pumpkin pies. By the time we all sat down to dinner, she was exhausted. So one of us was put in charge of whipping the cream for the pies. Here's my favorite part, pumpkin pie with runny whipped cream. None of us ever learned how to whip cream! I love my apple cranberry pie. And scraps, of course. I love my homemade cranberry relish. In fact, once Thanksgiving arrives, seems I'm making a batch every week. Love, love, love it. I would also love to give your scraps a new home. THANKS! I would love to win your scraps! My favorite thanksgiving food is ... um, ALL of it! The broccoli rice casserole, the stuffing, the deep fried turkey my hubby makes, pecan pie (yum, yum). The food doesn't really matter - it's the fact that we're all together that matters. And I'm right with you, I love reading everyone's blog! I have to admit my very favorite Thanksgiving dish is dressing/stuffing. The real kind, not out of a box. It's about the only time I make it, but it sure is yummy! Thanks for the chance. Yummy....fabric. Who thinks about food when fabric could be sneaking into your house? I would love scraps! I also love homemade peach jam on fresh from the oven rolls, but seriously fabric is much better! I love the pumpkin pie artfully decorated with whipped cream! And a hot cup of coffee, too. Thanks for the chance to win your scraps. My favorite is an odd family tradition: scalloped oysters. It's a tradition my Grandma started, and has been a favorite with friends & family for 30+ years. Since she died, I have made it every year, and I always think of her. Thanks for the giveaway! I was so happy to discover your blog. I love scraps especially scraps from other quilters. Thanks for participating in this fun giveaway! Sweet potato casserole that my daughter makes is to die for! We all LOVE it! This is my first visit to your blog and I've enjoyed looking around so much! I'm headed over to Quilty Giveaways now! Thanks for the chance. The home made rolls with lots of butter! Best thing to eat @ Thanksgiving? Cranberry-orange relish! I get out the old hand crank and it takes about an hour, but worth every second! Best about 2 days after you make it, so if made a day or so b/f the Thanksgiving meal, it's melt-in-your-mouth wonderful! My favorite is Sweet potato casserole with lots of nuts on top. Thanks for including me in your giveaway. Isn't every Thanksgiving food delicious? How do you choose just one? Guess I would have to say it is the sausage and sage stuffing.